Color Match Masonry – We Match Every "Mismatch" Color Match Masonry. The Brick Staining Experts! "We match every 'mismatch" problem. The color match masonry restoration solver. Color Match Masonry is a leader in providing value-added masonry coloration services to our customers by creating a successful partnership with them. Our Pledge is to establish lasting relationships with our customers by exceeding their expectations and gaining their trust through exceptional performance. Before our brick work staining. After our Brick work staining. 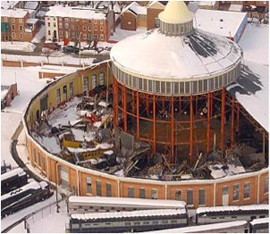 Do you remember that devastating Blizzard of 2003? It tore Baltimore up. 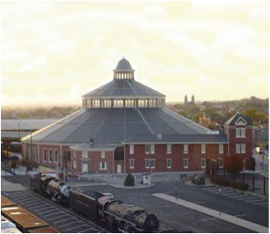 Many homes and businesses were damaged along with Baltimore's beloved B&O Museum. The collapsing roof crushed Baltimore's heart as well. A combination of Baltimore experts joined forces - And fixed it! We at Color Match Masonry (CMM) were honored to be part of that project. Whether you are an iconic building manager or a resident who loves your home, Color Match Masonry can help you out! For over 30 years, Color Match Masonry's owner Rob Vanbreevoort has been matching the color of brick, stone, mortar & architectural details for clients that include commercial properties, home owners, architects, and contractors. Color Match Masonry, now 15 years in business and offers a 25 year warranty. Color Match Masonry is the company to call when you need a color match. When there is a difference in brick and mortar color, many home owners, contractors and architects only think of replacing the whole structure without considering the great savings of staining instead. Color Match Masonry applies a specialized stain which provides the absolute match that every masonry project requires - guaranteed. Any brick, mortar and stone architecture that has color matching issues Color Match Masonry can handle any project. Click on our Services page to see one or more of the many ways we can help. Forget the dreaded thought and expense - Remember this - if it absorbs water, it absorbs stain. JUST HAVE COLOR MATCH STAIN IT. Don't let the value of your home or commercial building drop in value due to non-matching colors and damage from the elements. The stains applied by CMM will not peel, fade or crack, and they are completely maintenance free. Color Match Masonry will make your home or business more visually appealing, which will increase the property's value. It's your investment, you make the choice. Call Color Match Masonry for a free estimate at 410-768-1868.